For the last five months we've been living in Clarkston, WA in Tommy's grandma Shirley's bunk house. Think "hunting lodge laced with Wes Anderson accents and shag carpet" and you'll be imagining it about right. Tommy's grandpa built it and I promise before we leave this space that I'll do a photo essay about it. It's pretty amazing. This transitional stage here in Clarkston has had many blessings along the way, one of them being that Ruby has gotten to know her great-grandma "Mema" very well. Mema is truly an incredible woman--unlike anyone else I've met. She's 84, plays the drums at church, keeps an immaculate house, crafts bronze figurines from scratch (clay formation etc.) and used to be a star tennis player in her younger years. The stories told about Mema and Grandpa Vern are book-worthy--and not just because they're sensational, but because they're laced with moving lessons about hard work, family, and love. Mema's house, built by Grandpa Vern, is a masterpiece with big beams and eccentric woodwork. There's a little theatre downstairs where the kids put on shows. Ruby and I love to go visit. Usually we find Mema working on puzzles and we help put a few pieces in, maybe watch a bit of Judge Judy, and chat about what the day will hold. Ruby loves to go up and see the "scary ki-y"....a stuffed bobcat up in the guest bedroom. Mema's sister was an amazing taxidermist and so all around the house you'll find her work. This big red tub was something Grandpa Vern put in, but the color is one of Mema's favorites and in the spring and summer you can find her wearing shoes that match the tub perfectly. 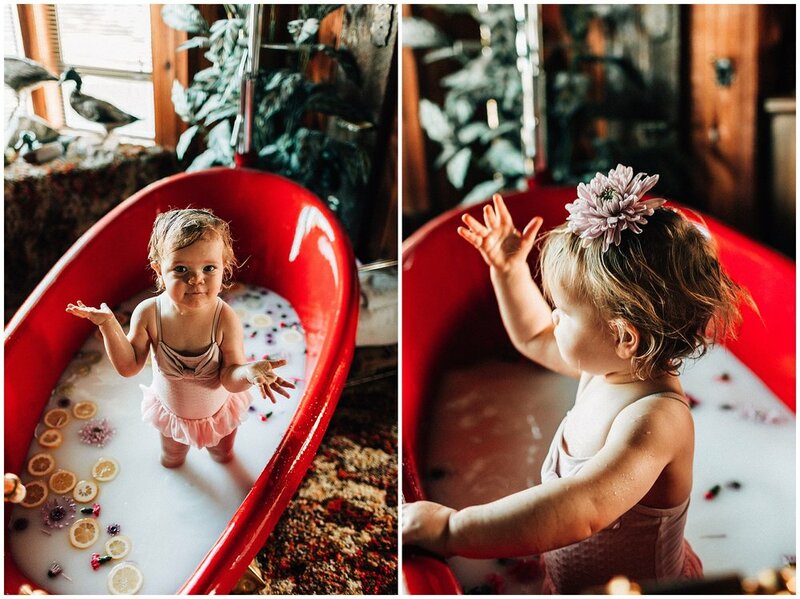 I've been looking for an excuse to go photograph the tub and Valentine's Day seemed like just the right occasion to put a bunch of flowers in there and let Ruby splash around. <3 I hope these images bring a bit of happiness and that you'll love the ones around you well tomorrow!